Scrunched up or spread out, the easy-to-memorize vertical patterning on this rectangular scarf looks great. 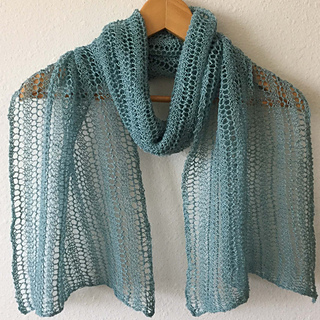 The reversible garter stitch lace repeats across 5 stitches every row, so it is simple to customize the size in a variety of yarns. Since the size can be customized, a variety of yarns can be used. For garter stitch lace, usually a needle two sizes larger than recommended for the yarn works well.